Le Radiant Baby a été crée à New York, exposé dans le monde entier et pendant deux mois il sera béninois ! Grâce à l’incroyable générosité et à la confiance renouvelée d’Enrico Navarra*, qui prête à la Fondation Zinsou l’intégralité des œuvres (35 œuvres) de cette exposition, qui se veut aussi ouverte et aussi inclusive que l’était le travail de l’artiste, la Fondation Zinsou célèbre Keith Haring, dans tout ce qu’il a de plus joyeux, de plus iconoclaste et de plus universel. Keith Haring in Cotonou est pensée et construite à partir du journal intime de cet artiste mondialement connu et reconnu. Ce journal intime devient ici la ligne conductrice, cette ligne commune à toute l’œuvre de Keith Haring, cette ligne qu’il peaufine depuis toujours, cette ligne qui définit le contour de l’œuvre, les personnages, les pleins comme les vides, cette ligne qui relie chaque tableau, chaque espace, chaque propos. La ligne qui est à l’origine de la pureté absolue du Radiant Baby – ou qui se fait sonore pour un ghetto blaster ou un barking dog – est également celle qui dessine les contours des menaces pesant sur la société : nucléaire, perte de l’individualité et de l’identité propre à chacun au profit d’une culture de masse, montée en puissance des machines et ordinateurs qui risquent de prendre le contrôle, sida – maladie que l’on découvre alors à travers les nombreux morts qui jonchent les années 80. Ainsi accompagné par Keith Haring, le visiteur peut découvrir ses œuvres à travers ses propos et ses réflexions – véritable voyage initiatique – pour mieux appréhender son message pur et intègre qu’il souhaitait avant tout accessible au plus grand nombre et libre de toute interprétation. The Radiant Baby was created in New York, travelled all around the world, and will now, and for two months, become Beninese! Thanks to the incredible generosity and the renewed confidence of Enrico Navarra*, who has lent all 35 works of this exhibition to the Fondation Zinsou, we celebrate the work of Keith Haring in all its most joyful, effervescent universality through this exhibition, which has been designed to be as open and inclusive as the work of the artist himself. Exhibiting the work of this Pop art icon in Cotonou, whose cheerful, colourful, irreverent work is almost childlike in appearance, the Fondation Zinsou wishes to pay tribute to the artist’s philosophy of « Art for everyone »; it allows us to see his work in a new light, offer new interpretations of his paintings and bring his work to life for those who, until now, were unfamiliar with it, but who will recognize something of themselves in what they see. 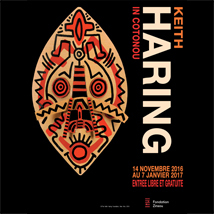 Keith Haring in Cotonou was designed and structured based on the diary of this world famous artist. In this exhibition the diary becomes the guiding thread running throughout Keith Haring’s work, an endlessly honed line, which defines his characters, the voids as well as the painted spaces, a line which creates a connection between each painting, each space, each statement. This line, which is the source of the absolute purity of the Radiant Baby, and takes on pulsating accents when it turns into a ghetto blaster or a barking dog, also delineates the threats that weigh upon society: the nuclear peril, the loss of personal identity in the midst of mass culture, the increased power of machines and computers threatening to take over the world, and the spread of AIDS, with its death toll growing throughout the 1980s. The visitor embarks upon this exhibition guided by Keith Haring, and discovers the artist’s work through the prism of his remarks and reflections – a true initiatory journey – to better understand his pure, principled message, which he wished above all to be understood by all and free from imperative interpretations. *Enrico Navarra, a renowned collector and art dealer, has once again placed his trust in the Fondation Zinsou, after the 2007 « Basquiat in Cotonou » exhibition, all works of which had been lent by him.